In the midst of our exams, came a very important application deadline for students who had a vision to become leaders in the Engineering industry. 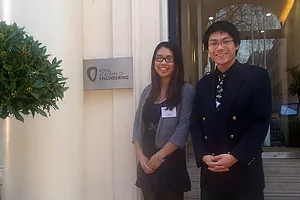 It was the Royal Academy of Engineering Advanced Leadership Awards. In my eye, this was the first and most basic test of leadership: time management. Only those with the effective control and use of time would be able to organise time for revision, coursework and still submit an outstanding application. Run annually, hundreds of applicants were whittled down to 70 from across the UK for the selection day with just 35 future leaders chosen to receive the award. Winners receive a significant sum of money to develop desirable knowledge and skills according to their initial application. In 2015, 5 outstanding students were proudly selected from Sheffield to the selection day where a series of group work and interviews would be conducted. It was so competitive that the organisers admitted that even in their student careers, they themselves would have been unable to compete! They also empathised the day would not be used to identify who was the best, but rather who could gain the most from the award for subsequent career developments. Illustrating this, they explained that through our initial application, they had already identified each person in the room to be a future leader and hence highly recommended us to network as much as possible because the names of those present will be seen again and again in the coming years as the innovators and shakers of industry. Held in London, applicants from as far as Scotland showed their dedication to arrive the night before. The status of the Royal Academy showed when they housed our accommodation next to Triangular square, a short walk from Buckingham palace! After the introduction by Dr Forristal, the head of research and development. Students were placed into groups and undertook team tasks. Meanwhile, other groups went for their interview. Following this was a break to recover and switch tasks. Here, many took the opportunity to share experiences and gain contacts. My SELA training from Mr Kintish quickly kicked in and I easily assessed which conversations to engage in. I met many students from different universities and even found students who shared my own interest in Spacecraft. Queen's University of Belfast had a very large number of students selected and unsurprisingly several students from the University of Bristol’s Engineering Design leadership oriented course. After the break was a free slot for our group before the individual interviews. Whilst networking was great, my first priority was to perform my best in the interview. I was able to use this time to double check my preparations. Finally, it came to my turn for interview. With every foot step, my heart thumped and my determination and nervousness increased. Me and several students were led to a corridor deep within the academy before being told which rooms to wait by. The other students’ rooms almost immediately opened and they disappeared behind closed doors to leave me alone. My own door remained closed. At this point I considered knocking before I ran away. Instead I found myself gulping and tilted my head a little higher. After another eternity, the door to my destiny finally opened and I saw my judges. To my astonishment, my mouth still worked and sounds came out resembling an introduction. Some say that a manager’s job is to maintain the status quo and a leader’s job is to challenge this whilst respecting other cultures. I imagined it must have been a little strange to walk into the interview room and take my suit jacket off revealing my Space Society black committee polo and my Boeing 747 tie. Luckily this strange combination was well accepted and showed my commitment to the aeronautics and astronautics industry whilst maintaining a respect for the style of the event. The rest of the interview progressed well and I was able to respond coherently to questions about my past and my application. The interviewers were genuinely interested in my life and were very kind giving me the chance to show my true character. Afterwards, the walk back to the common room seemed a lot shorter! To round off the exhausting selection day, my final group task was to assess the financial viability of a new airport on the Thames estuary. This multi-faceted problem certainly created my fair share of head-scratching. Hats off to my Mechanical Engineering department, they had enrolled us in a finance and accounting module just the previous semester and I was not too out of depth with terms such as non-current assets and gross/net/operating margins. By this time, I swallowing my huge 1.5L Lucozade bottle like a race car and a can of NOS. I am very grateful to have been given the chance to not only meet students from other universities but also to walk alongside my Sheffield colleagues to create new experiences together. If any of you are reading this, I wish you the best of luck and look forward to seeing your names in the news!